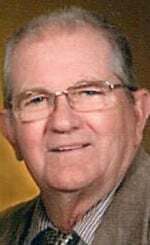 Edgerton, WI -- Marven A. Sanden, age 79, of Edgerton, died on Thursday, February 7, 2019, at St. Mary's Hospital, Madison. He was born in Dickinson, ND on January 20, 1940, the son of Orven and Emilie (Godlevsky) Sanden. He was a 1958 graduate of Ithaca High School, WI. After graduation he enlisted in the U.S. Navy from August 14, 1958 until June 25, 1962. He married Kay J. Knappenberger on November 27, 1965. Marven owned and operated K&M Stone & Coal, Kamtec Enterprises and Sanden Trucking. He was a member of Central Lutheran Church, AOPA (American Owners & Pilots Association) and North Freedom Railway. Marven is survived by his wife, Kay of 53 years; nine nieces and nephews: Jeannie, Connie, Gary, Jeff, Mika, Beau, Cass, Bernie and Ginger; brother-in-law, Jack Wilkerson; and numerous great-nieces; great-nephews; and other relatives and friends. He was preceded in death by his parents; brothers: Gorden (Helen), Sid (Betty), Vernon (Deb); and a sister, Sandra Wilkerson.